Finding a lump under your armpit can be scary, especially if the lump doesn’t go away on its own. Although a lump under the armpit is sometimes associated with serious conditions, such as breast cancer or lymphoma, a lump is often harmless. The best way to know the cause of your lump is to see a medical professional. FastMed Urgent Care is available every day of the year, and our modern, state-of-the-art clinics are a more convenient and affordable alternative to the emergency room for non-life-threatening injuries or illnesses. There are more than 20 lymph nodes in the armpit. Lymph nodes are part of your body’s lymph system and a key component of the immune system. The lymph nodes carry lymph fluid, waste material, and nutrients between the body tissues and the bloodstream. When lymph nodes become swollen, it is usually an indication of an infection. Lipomas are non-cancerous, fatty lumps that commonly occur in the neck, shoulders, armpits, back, and thighs; however, they are rarely dangerous. Although lipomas are most common in middle aged people, they can occur at any age. Allergic reactions to iodine, penicillin, or certain vaccines are known to cause lumps under the armpit and will usually go away on their own after a few days. Cysts are pockets of noncancerous tissue in the skin that become filled with fluid or pus. Cysts can develop as a result of infection. Lymphoma is a cancer that attacks the lymph system and often requires chemotherapy or radiation therapy. Breast cancer is a life-threatening disease that affects about 1 in 8 women in the United States. However, men can also have breast cancer. In fact, a man’s lifetime risk of breast cancer is about 1 in 1,000. 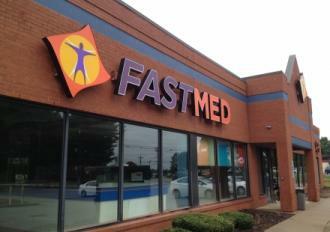 FastMed is your one-stop shop for comprehensive family practice and general medicine in North Carolina and Arizona. Our walk-in clinics offer quality medical care 365 days a year (no appointment necessary), have extended hours during the week, and offer conveniences like online check-in and bill pay. Want to see for yourself? Stop by one of our clinics today!